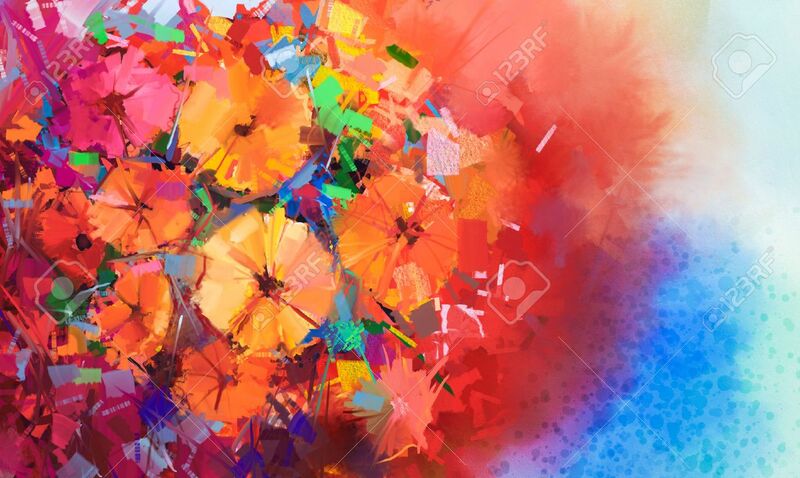 Abstract Oil Painting A Bouquet Of Gerbera Flowers .Closeup Still Life Of Red Color Flowers With Soft Red And Blue Color Background. Hand Painted Floral Impressionist Style. Фотография, картинки, изображения и сток-фотография без роялти. Image 43277882. Фото со стока - Abstract Oil painting a bouquet of gerbera flowers .Closeup still life of red color flowers with soft red and blue color background. Hand Painted floral Impressionist style. Abstract Oil painting a bouquet of gerbera flowers .Closeup still life of red color flowers with soft red and blue color background. Hand Painted floral Impressionist style.